Until 40 years ago, through-hole mounting was the dominant method for placing electronic components on printed circuit board assemblies. For years, this method was used to place virtually all components in the time period from the 1950’s until surface mount technology became popular in the 1980’s. Although SMT is now used to place over 90% of electronic components because of the advantages provided by automation, through-hole mounting is still thriving in select use cases. While board designers appreciate the smaller sized components and greater functionality provided by SMT, through-hole continues have a niche in printed circuit board assembly. VR Industries offers both surface mount technology and through-hole component placement, and our manufacturing experts are equipped with the technical expertise to determine the best way to manufacture your PCBA. The following overview provides a comprehensive look at surface mount technology and through-hole mounting giving insight into each method. 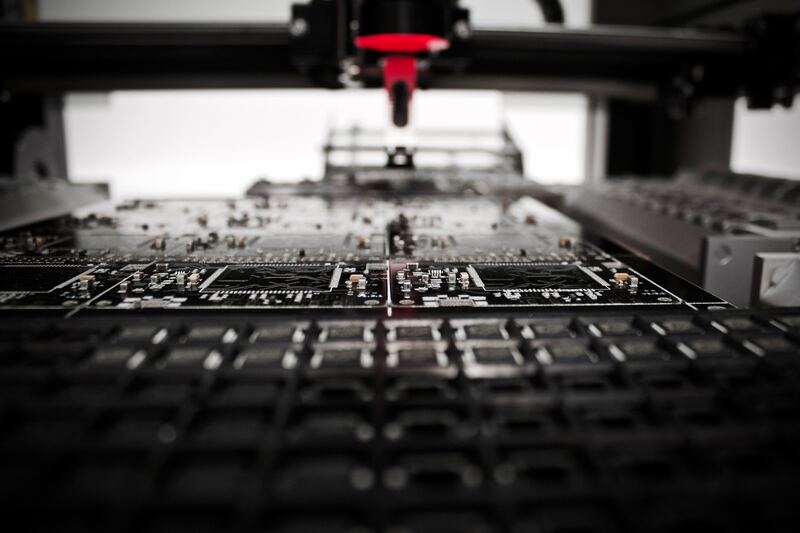 Often referred to as SMT, surface-mount technology is an automated method for mounting electronic components directly onto a printed circuit board. In VR’s process, solder paste is screen printed over the component pads using a custom stencil while the SMT machine is programmed and components are loaded in a magazine that feeds into the machine. Components are then placed on the bare boards and passed through a reflow oven so that the solder paste fuses the components to the boards. Since SMT components do not go through the board, components called vias are used to create a conductive connection between the different board layers. Vias can also be utilized to connect to specific layers which also contributes to space savings. In general, SMT boards are smaller and faster. This is the result of SMT components being much smaller and increased component density on the boards. Smaller boards are especially helpful for designing the final product. SMT boards don’t require holes to be drilled into the board to place the components. This means sourcing bare boards is easier and less expensive. Commonly called THM, through-hole mounting is a manual process where a technician solders components to the PCB by inserting leads into pre-drilled holes. Two types of leads are used for THM: Radial and Axial. THM creates a strong bond between the component and PCB. As a result, it is used in military and aerospace products which require a high tolerance for environmental stress. Even though through-hole may seem outdated, it will continue to be utilized while it still provides practical benefits. SMT will always prove to be more efficient but special considerations must be taken into account before settling on a manufacturing plan.